Before beginning the following procedure, you must complete the steps in Generate SDKs for an API Using the API Gateway Console for iOS in Objective-C and download the .zip file of the generated SDK. The following procedure describes how to install the SDK. Extract the contents of the API Gateway-generated .zip file you downloaded earlier. Using the SimpleCalc API, you may want to rename the unzipped SDK folder to something like sdk_objc_simple_calc. In this SDK folder there is a README.md file and a Podfile file. The README.md file contains the instructions to install and use the SDK. This tutorial provides details about these instructions. The installation leverages CocoaPods to import required API Gateway libraries and other dependent AWS Mobile SDK components. You must update the Podfile to import the SDKs into your app's Xcode project. The unarchived SDK folder also contains a generated-src folder that contains the source code of the generated SDK of your API. Launch Xcode and create a new iOS Objective-C project. Make a note of the project's target. You will need to set it in the Podfile. This installs the API Gateway component and other dependent AWS Mobile SDK components. Close the Xcode project and then open the .xcworkspace file to relaunch Xcode. Add all of the .h and .m files from the extracted SDK's generated-src directory into your Xcode project. 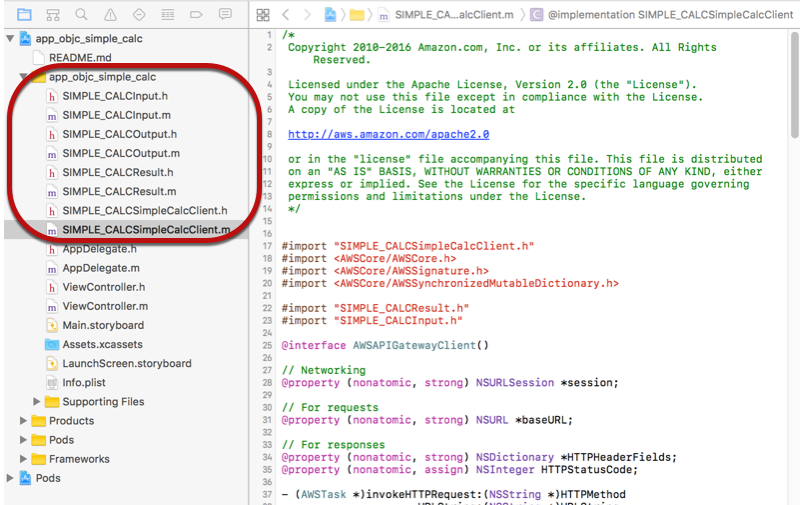 To import the AWS Mobile SDK for iOS Objective-C into your project by explicitly downloading AWS Mobile SDK or using Carthage, follow the instructions in the README.md file. Be sure to use only one of these options to import the AWS Mobile SDK. The AWSTask.result property is of the SIMPLE_CALCResult type if the Result model was added to the method response. Otherwise, the property is of the NSDictionary type. The following procedure describes how to call the API methods in Objective-C app source code; for example, as part of the viewDidLoad delegate in a ViewController.m file. The #import statement also imports SIMPLE_CALCInput.h and SIMPLE_CALCResult.h for the two model classes. where the helper function handleApiResponse:task formats the result as a string to be displayed in a text field (_textField1). The resulting display is 1 + 2 = 3. The resulting display is 1 - 2 = -1. The resulting display is 1 div 2 = 0.5. Here, div is used in place of / because the simple Lambda function in the backend does not handle URL encoded path variables.